My daughter has an awesome play kitchen that her daddy built her for Christmas last year. I’ve made her several pieces of fun play food, and she’s received some as a gift, but for some reason she doesn’t have any play “beverages”. 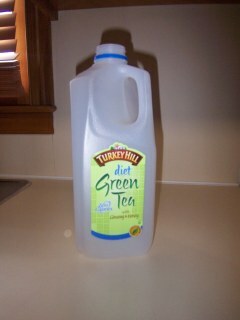 This past weekend on a whim, I decided to make her a play milk carton by recycling a Turkey Hill Tea jug. 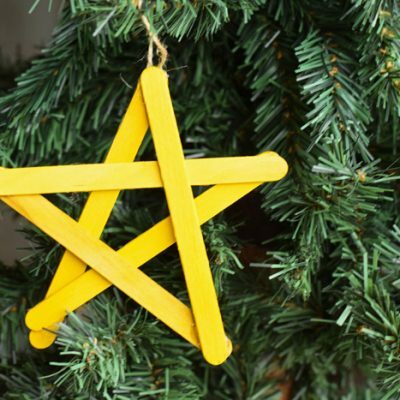 It’s simple, cute, and inexpensive, and hopefully it will serve the purpose for a while. Use Goof Off or something like it to get all the labels off of your carton. You need a smooth surface with no leftover label residue. Wash the outside of the bottle to remove any chemical residue and let dry. 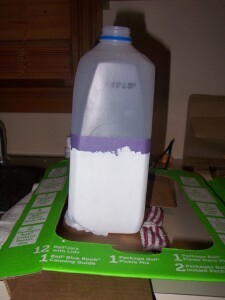 Use painter’s tape to tape around the middle of the jug. 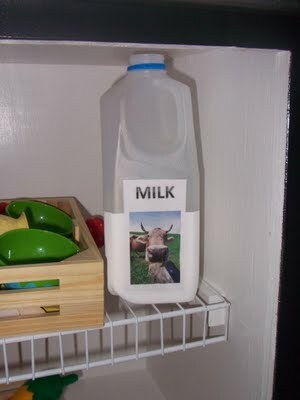 The idea is the have the effect of a half-full milk jug, but you can place the tape wherever you want. Using white paint, paint up to the line of tape. I also painted the bottom of the jug. Let the paint dry for a few hours, then apply another coat. Let second coat dry for a few hours, then remove the painter’s tape. 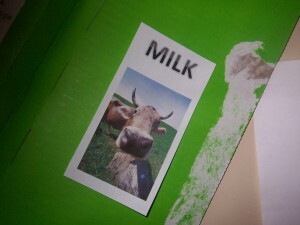 Using your computer, make a milk carton label. 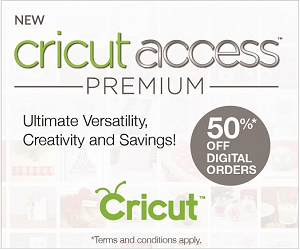 Here is where you can get creative! I just used a clip-art picture of a cow, but you can use whatever you want! You can name your “milk” brand after your kids, etc. Cut the label to the appropriate size for your jug. Apply the clear packaging tape to the front of the label, leaving only about 1/4 inch overhang of the tape on all four sides of the label. This “overhang” is to affix the label to the jug. 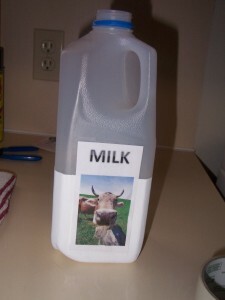 Carefully place the label on the front of the jug and press on all four sides of the label to secure it. 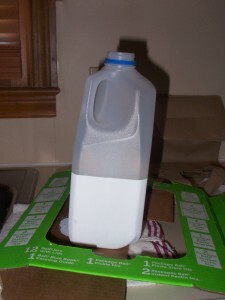 It’s time for your little one to enjoy milk out of their new play carton! Thanks for linking up to Making the World Cuter this week! very cute idea. I just adore play food. What a fun idea! Sometimes I wish my baby was a toddler so I can make (and buy) lots of fun toys for him. 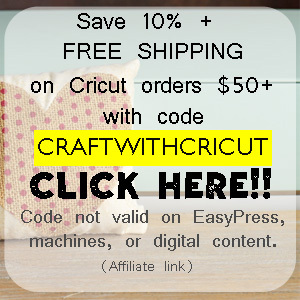 I hope you will link this up at my Delights Me party at Doodles & Doilies! 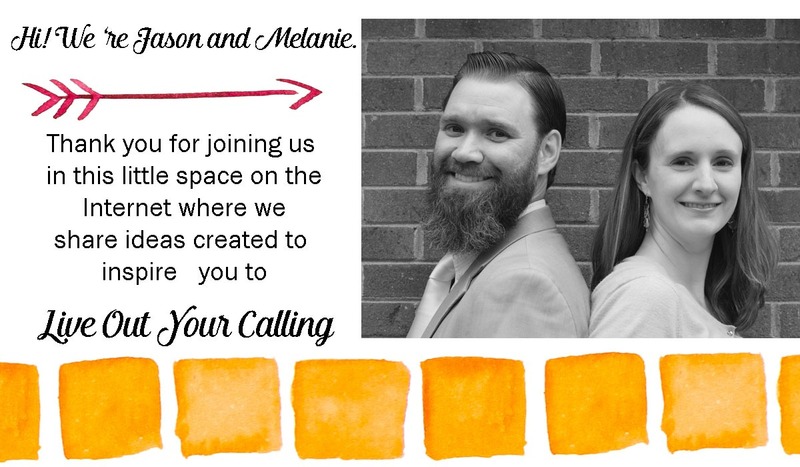 Thanks for linking up to Delight Me at Doodles & Doilies! I look forward to see more from you. See my kitchen in Romantic Homes Magazine September 2011! Cute! My daughter has a too small play kitchen for that tall half-gallon, but I bet a quart or different size bottle/jug would work. Great idea! Absolutely adorable! It makes me long for the days when my girls were younger an would spend hours playing restaurant, chef, and grocery store with their play kitchens! This is so, so cute! I just love it! 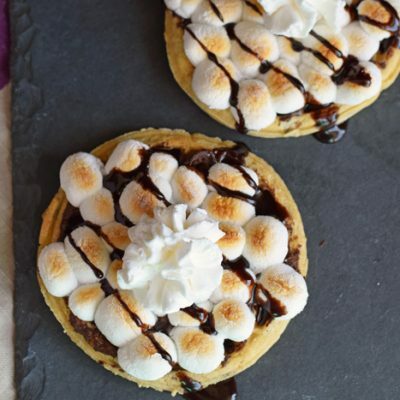 Thank you so much for linking up at Savvy HomeMade Monday, Melanie. I hope you will party again tomorrow! 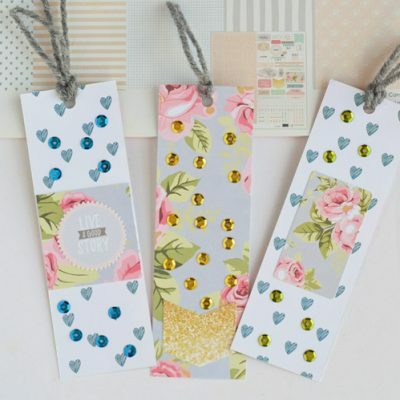 We are featuring this craft at Kidding Around Friday! Come on by and link up again!